A 250 watt solar panel, is too much solar power for the Scampy Team's needs. However, our thinking is, that during the depths of winter, our house battery will remain fully charged. As far as solar power is concerned, we are now home free! Note: FedEX notified that the Yingli will be delivered 09/15. Do you recall when I was walking with a cane? Or when my right arm, hand and leg developed an uncontrollable twitch? My balance was terrible. I fell down often. Could not walk in a straight line? Could not pick something up from the floor without holding on to something for support? Well, look at me now! All of those symptoms of old age have evaporated! It's a miracle! I attribute this miracle to my stopping prescription medication! I no longer visit my Kaiser doctor anymore. I am not saying that doctors are no longer necessary for me. What I am saying is, that I now take great care about going to see my doctor. Tránsito's hitch ball was installed by U-Haul in Salem. The hitch ball assembly came with a lock washer placed between the nut and the hitch bar. I have never liked lock washers. First of all, the spring action of a lock washer only comes into play when the nut is already loose. Also, the contact surface of a lock washer is sooooo small! 1-1/2" open-end/box wrench. The iron pipe is secured to the wrench with two hose clamps. Now the wrench/pipe assembly functions as a torque wrench of sorts. And I am able really tighten that nut down. Curt recommends a 250 lb torque for their 1" shank balls. I intend to buy a torque wrench so that I do not over-tighten the hitch ball nut. I replaced the lock washer with a hefty flat washer. Much better! Up until today, we have connected the Renogy solar panels straight into Scampy's house battery. In other words, we bypassed the Adventurer battery charge controller that is part of the Renogy Solar Suitcase. We did that bypass, because the Adventurer appeared to taper its charging far too early. The house battery never got a full charge. Now we have hooked up the Adventurer battery charge controller because the house battery appears to be fully charged. The Adventurer is a PWM type controller. Note: If we encounter inclement weather, the plan is to cover the Adventurer with a plastic bag to protect against becoming wet. 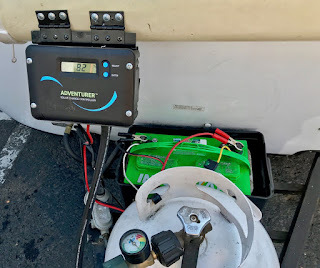 The Adventurer battery charge controller is mounted only temporarily in this outside location. Hi George, love hearing of your projects. It's a way of life.... Do you think that stopping you medications improved you psycological/emotional health in addition to your phyisical improvments? Yes! Definitely improvement in psycological/emotional health. But those took much longer. Memory improvement. A feeling of calmness. I am still in the process of medication recovery. Lately I've noticed that my muscular coordination is improving. I used to have a hard time putting on pants! My feet would not want to go into the pants leg! Now I put on my pants sooooo easily. I showed my friend Rowena how am now able to pick up something from the floor without needing support from a nearby chair or table. Also, I am now able to do a deep knee bend all the way to the floor and rise up to a standing position. Without support! So lucky you figured that out George! I agree some doctors are to eager to prescribe meds we don't necessarily need. I opted out of thyroid pills when doc said I need to take it, I opted out of hormone pills when I went through menopause, I only take meds when I absolutely need it. BTW I've worked in legal industry and sat at a juror in several cases. Initially the law goes strictly by the book...i.e. what law was broken and based on that the court will decide. However, you can appeal the decision and at that time you introduce circumstances as to why the law was broken and most generally you can win your case. As a hearing assistant, I always let the attorney and/or client know they can appeal the decision. Of course, why the law was broken might come into play early on during trial by the defendants attorney. The prosecuting attorney will concentrate on only the law that was broken i.e. did you call 911 when there was no emergency as defined in the law/regulation? Yes or no? The prosecuting attorneys are good at yes/no questions and can't explain. I myself have been screamed at DID YOU PUT YOUR BRAKES ON? YES OR NO! I screamed back YES ID DID!!! Wherein the judge counseled the prosecuting attorney you are not Perry Mason quit screaming and yelling! I won my case but had witnesses come forward unbeknownst me who had been at the scene. Thank you sooooo much for sharing. I enjoyed reading your legal insight based on your own experiences! P.S. I did not have an attorney. The Cadillac I broadsided at the intersection took me to court & said I ran a red light when in fact the light was green. She ran a red light and brought two attorneys with her to court. By standers who filled out the witness cards came forward to testify and I won my case. Saw your solar panels and you said they put out a lot more power than the three 15 watt panLes I have on my boat dock. What type of panels are they? Click [Here] to go to the site where I bought my solar kit. I’ve been reading your blog each morning for many years through good times and bad. I checked daily when you stopped blogging hoping that you’d return. I admire your generosity of spirit in sharing your experiences. Your resilience in the face of the challenges of living on the road are inspirational. Now, let me see if I’ve got this right. - You confessed to the 911 operator—on tape—and on your blog that your call wasn’t an emergency. - The potential penalties for this crime are substantial. - The Prosecutor is offering you a chance to plead guilty to lesser charge and lesser penalty. - You’re now fighting for your right to be found guilty of the greater charge. Now, consider how much you have to lose and the hands of those who don’t know and respect you. Your lawyer will be delighted for all the billable hours ($20K or more?) of seeing your case through to its lengthy and inevitable conclusion of finding you guilty as charged. The judge could decide you are a belligerent vagrant who deserves a lesson in respect for authority and sentence you to jail for the crime along with extra time for wasting the time of the police, 911 and the court. Will your truck, trailer and bird be held by friends or in a police impound lot for considerable daily fees and sold at auction if you can’t afford to pay those fees upon release from jail. Oh, and there’s that RV park space you’re waiting for. What will they do if they cannot contact you with your chance to claim it or lose it? Sure there are abuses of plea bargaining. But refusing a plea bargain makes sense only for those who are innocent and have a chance of being exonerated of a crime they never committed. When you find you’ve dug yourself into a hole, stop digging. So, you believe that I am making an error in going to trial? Yes, I don't think going to trial will do any good for you or anyone else. The Prosecutor handed you the best deal he could given the constraints of the system. Sure, he could have dropped the charges and that would be good and benevolent, but his evaluations and promotions depend on his conviction rate—not upon his being benevolent. So, this is a win-win: he gets to rack up another conviction (albeit on a lesser charge) and you get off with a slap on the wrist and go off on down the road to live your life. If you're pursuing this to *send a message* about the evils of plea bargaining, I suggest your money might be better spend on contributions to the Innocence Project whose lawyers work to free the wrongly-convicted, many of whom were ram rodded into plea deals in fear of a potentially harsher sentence. Your going to trial will almost certainly result in conviction. The evidence is clear: you knew it was not an emergency and thus first called several non-emergency numbers. Having gotten no good result with those calls, you called 911 and immediately told the operator 'this isn't an emergency'. Afterwards, against the good advice of your attorney, you blogged testimony about it. With a simple series of yes/no questions this will be a slam dunk victory for the prosecution unless you have some witnesses that will come forward and say the officer was indeed putting you in reasonable fear for your life. Otherwise, it will look like you now just have some conveniently revisionist stories to tell. The thing is, I don't understand what you're fighting for here. After all you have repeatedly said you were wrong to argue with the cop and even in the heat of the moment you said it wasn't an emergency and nevertheless you called 911 knowing it was wrong to do so for a non-emergency. If you have deep pockets, go for it if you want. I'd take my lawyer's advice and if I didn't have a lawyer, I'd plead guilty and beg the judge's forgiveness: "Hey, I was scared, I've never called 911 before. I didn't know what to do. Please don't think I am a total nut case and take away my driver's license." How do you know that the city attorney will take my case to trial? The decision for the city to go to trial, has NOT been made yet. Are you planning to leave the charge controller outside Scampy permanently? Aren't you concerned that sooner or later it's going to get splashed or rained on? Is there no way to put it inside? All it takes is more wire. The charge controller is in a temporary location. That controller is not the controller that is to be used with the Yingli panel. I agree with you to fight them with your wit and honesty. You felt in danger. Why does it matter who or what made you feel that way. You were scared, plain and simple. BTW, what does the Transito with Scampy in tow, get in gas mileage? I am not going with a plea bargain, because it is a rotten system. I would be a hypocrite, if I did not reject a plea deal. I have not calculated the gas mileage. The incident where you hired the kid to get revenge for your stolen drill will come up and not help your case at all. I know you backed off of that story after your attorney went ballistic, but you can't you can't unring a bell. George: A spring type lock washer is much better than a flat washer. Ask any Mechanical Engineer and they will tell you you're asking for trouble thinking a flat washer is better than a spring washer. The whole function of the spring washer is to dig into the nut if it starts to back out and prevent it. A flat washer does nothing. Do you agree that when a lock washer is torqued down, it is now a very flat washer that is very small in diameter? No I don't George. Now it's a compressed lock washer that resists the nut trying to turn backwards. Do you think it loses it's "spring" when it's torqued? You're right on with your panel size. As I've said, my is 235W and works in almost any weather. We did four months in the western U.S. and Canada without a generator and much of what we did or almost all was boondocking. We cut it close a couple of times but the panel did its job. It's big enough that you could, in the future, add more battery. I'm thinking of doing that. I'm very interested to see how this solar setup works out. George: This reminds me of the time I got a DUI and went to trial because I (mistakenly) believed I wouldn't be found guilty. I was, and I paid for it. You have a lot to lose and your case is even more likely than mine to end in a guilty charge because you have admitted you did something illegal on purpose. I'm not suggesting a plea bargain but I suspect you will end up going for quite a while not blogging. Why will I stop Blogging? Because you'll be in jail George. I thought that was pretty clear. So happy about your health! Did you know Magnesium is referred to as the "Miracle Mineral"? It sure helps keep the body in check, which helps the heart and wow, the CoQ10 is a great vitamin for the heart too! Keep the awesome health going! I just checked my vitamins. My vitamin C contains a supplement of 568mg magnesium . Awesome, George. Magnesium supplementation can rid prescriptions as we learned. Spouse takes 1600mg daily and doc reduced his prescriptions by four!!!! George when you were issued that ticket did you pay any kind of a bond ? ?